This guide will show how to create, edit, delete and share pipelines. Once logged in, click on the pipeline button in the top left of the screen. You’ll notice Enter Pipeline Name box, just below the Pipelines button. After entering pipeline name, you will see Saving.. and All changes saved notifications just to the right of the pipeline name box and buttons. In DolphinNext, autosaving mode is active while creating pipelines for ease of use. You may also use “Save Pipeline” button to save your pipelines. Another way to create new pipeline is clicking orange “New pipeline” button which is located at left sidebar menu. You can create a copy of your pipeline by clicking “Copy Pipeline” button and delete your pipeline by clicking “Delete Pipeline” button. While creating your pipeline, you can always check the created nextflow script by clicking “Download Pipeline” button. Settings icon, located at the top, opens “Select Process Revision” window where you may examine the current state of process or you may jump to the other revisions and replace the selected revisions on the workplace. Pencil icon which is at the center of the circle, allow you to edit process name which will be placed in the nextflow file as a process name. Therefore process names should be unique in overall pipeline. At the bottom of the process circle, bin icon is located to delete current process from the pipeline. By using the Pencil icon which is located at the left side of the circle, you can edit name of the input parameters. These names will be used while creating variables in the nextflow file, therefore these names should be unique in overall pipeline. 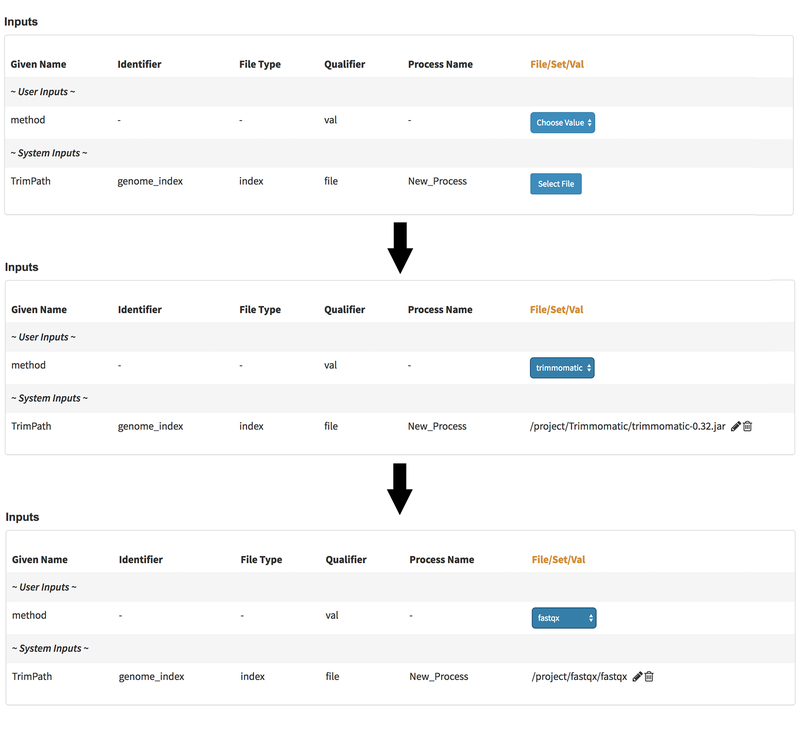 Newly created files that are defined in the Outputs section are selected by Output parameters circle. Output parameters are located just below of the Input parameters at the left sidebar menu and placed into workspace by dragging. The name of the circle determines the name of the published directory which can be edited by clicking pencil icon. 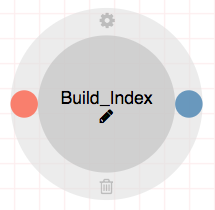 In the example below, both aligned and unaligned reads are selected by two separate green circles. Both of outputs will be transferred to separate directories called aligned and unaligned. If you don’t want to keep some of your output files, you may leave output nodes unconnected. Then only files that are selected will be transferred in the published directory. In order to transfer two or more outputs into same directory, you can use the same name for Output parameters. There are three main reasons for creating edges. To select outputs that will be published in the output directory. This procedure is facilitated by showing available nodes which are ready for connection. 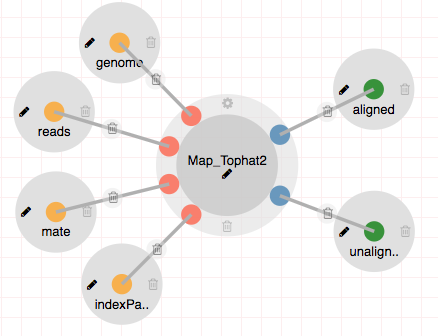 The figure below shows an example about this feature: Since mouse is over the output node: genome_index of the Build_index and DolphinNext shows the available node on the Map_tophat2 process by marking. This filtering is executed by checking file types of the set and file parameters and name of the val parameters. In this example, file type of the selected output node and the marked input node both index. 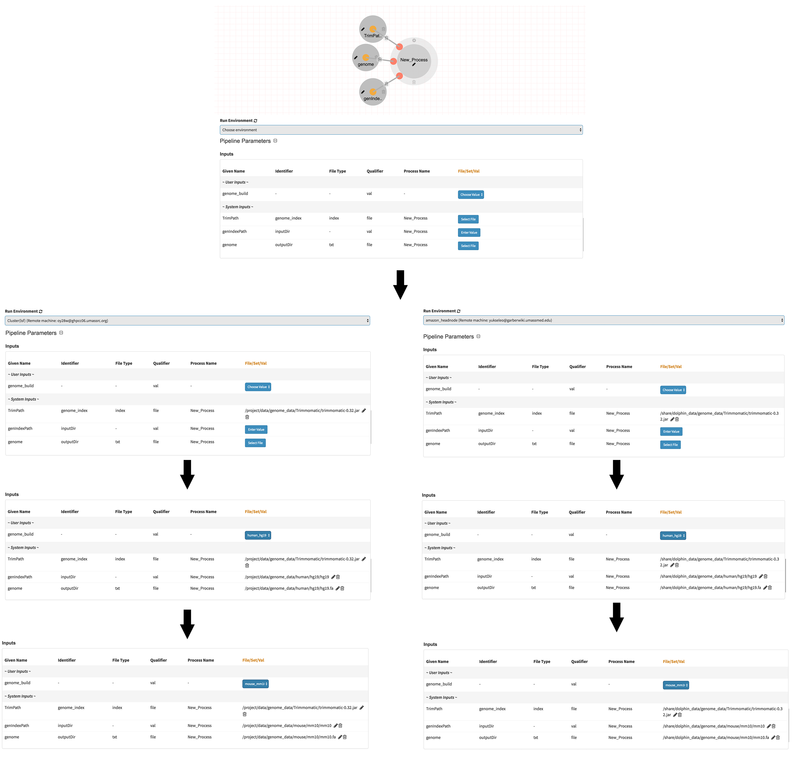 This feature is also available while connecting input parameters to multiple processes. This section allows you to add additional inputs, scripts or comments before pipeline starts. This way you may recall same function several times in the other processes. params.variableName = defaultValue //* @dropdown @options:"..."
Please note that you need to use params. at the beginning of variableName. You can define defaultValue with single/double quotes (for strings) or without any quotes (for numbers). params.genome_build = "" //* @dropdown @options:"human_hg19, mouse_mm10, custom"
params.run_Tophat = "no" //* @dropdown @options:"yes","no"
params.method = "" //* @dropdown @options:"trimmomatic, fastqx"
params.genome_build = "" //* @dropdown @options:"human_hg19, mouse_mm10"
Here, $HOSTNAME is DolphinNext specific variable that recalls the hostname which is selected in the run as Run Environment. Therefore, in this example, all <executor properties> will be automatically filled in case of pipeline is going to run on ghpcc06.umassrc.org. In the example, since run environment is selected as ghpcc06.umassrc.org, autofill feature overwrited the default $TIME value (1000) and filled with 3000. This section summarizes all used processes and input/output parameters to give you an overall view about pipeline. By default, all new pipelines are only seen by the owner. You can share your pipeline with your group by selecting permissions to “Only my groups”. If you want to make it public, you can change Publish option to ‘Yes’. After verification of the pipeline, it will be publish to everyone. It is always allowed to create a copy of your pipele by clicking “Copy Pipeline” button just to the right of the pipeline name box and buttons. When your pipeline is set to public or it has been used by other group members, it is not allow to make changes on same revision. Instead, new revision of the pipeline can be created and changes could be done on this revision.